PwC’s climate change analysts estimate global economies need to cut their energy related carbon emissions for every $ of GDP by 6.2% every year from now to 2100. That’s more than five times the rate currently achieved. The reduction target is an estimate of how much countries need to reduce their energy related emissions by, while growing their economy, in order to limit global warming to 2°C. 2°C of warming is the limit scientists agree is needed to ensuring the serious risks of runaway climate change impacts are avoided. For the sixth successive year of PwC analysis, the Low Carbon Economy Index, 2 degrees of separation – ambition & reality finds that the global carbon intensity (greenhouse gas emissions per $GDP) reduction target has been missed. The gap between what countries are doing and what’s needed continues to grow. Current total annual energy-related emissions are just over 30 GtCO2 and rising, on the back of GDP growth of 3.1%. In the same period, carbon intensity was reduced by only 1.2%, a fraction of what was needed. As a result the global challenge going forward is tougher than before - averaging 6.2% every year, to 2100. In the Index’s G20 analysis, an unexpected champion surpassed the annual target - Australia - recording a decarbonisation rate of 7.2% over 2013, putting it top of the table for the second year in a row. 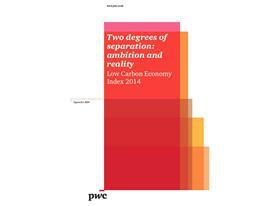 Three other countries – the UK, Italy and China – achieved a decarbonisation rate of between 4% and 5%. Five countries, however, increased their carbon intensity over 2013 – France, the US, India, Germany and Brazil. Current rates of carbon intensity mean the total amount of carbon the IPCC have advised the world can emit this century to limit climate change to 2°C, will be depleted within 20 years. Renewable electricity generation, excluding hydroelectricity, grew at 16% - a continuing trend for last decade with double digit growth every year. Renewables now account for nearly 10% of total energy mix in six of the G20 economies. "After a decade of carbon inertia, we are way behind, and now need to decarbonise at more than five times our current rate to avoid 2°C. But there are reasons for optimism. The E7 has woken up to the business logic of green growth, decarbonising faster than the G7 for the first recorded time. And globally renewables are emerging fast. As they approach cost parity the stage is set for a policy framework that shifts subsidies away from fossil fuels and accelerates the renewables rollout." The research is released just two weeks before a UN summit on climate change in New York (23 Sept) to be attended by world leaders, aiming to up the ante on national commitments to reduce GHG emissions. 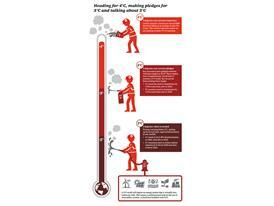 The PwC research demonstrates the disconnect between the global climate negotiations aiming for a 2°C limit on global warming, but national pledges may only manage to limit it to 3°C, and current trajectory actually on course for 4°C. Annual energy-related emissions in the G20 bloc need to fall by one-third by 2030 and just over half by 2050 to stay within the 2°C budget. Collectively, the G7 group needs to almost double its decarbonisation to 4.2% per year between 2014 and 2020. They have achieved an average decarbonisation rate of 2.2% between 2010 and 2013. Absolute carbon emissions (ie not just those related to energy) need to fall by 44% by 2030 and 75% by 2050 compared to 2010 levels. For the E7, a carbon intensity reduction of 8.5% per annum is required from 2020, followed by further reductions of 5.3% a year from 2030 to 2050 to stay within the 2°C budget – a five fold increase on current levels of decarbonisation. 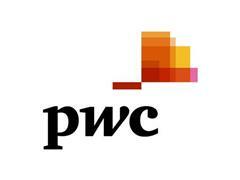 PwC’s sustainability & climate change team includes over 100 UK based specialists in climate science, policy, energy & renewables, climate & business strategy and carbon trading, and 800 globally. a. Australia recorded a 7.2% decarbonisation rate, partly driven by a fall in energy demand against a growing economy, and a 30% increase in hydroelectricity output. b. China recorded one of the top performances for a developing country, with a 2013 decarbonisation rate of 4%. A flourishing renewable energy sector playing an important part. However China’s strong achievement needs to be seen in the context of its roles as the world’s largest emitter, as well as its high overall carbon intensity – double that of G7 economies. c. The UK, third from the bottom in the 2012 list, is now the most-improved G20 nation on carbon intensity, and it is already one of the world’s most energy efficient economies. Improvements in energy efficiency, a national rise in renewable energy and the closure of two large coal plants, meant that UK carbon intensity fell significantly in 2013, alongside relatively strong economic growth. d. The Index finds that coal in the US has regained some market share from natural gas in power generation since its low in April 2012, causing an increase in emissions since 2007, and dispelling the myth that a shale gas revolution will necessarily result in emissions reductions. e. Germany – the large scale transition away from nuclear to renewable power has caused a short term increase in fossil fuel use. f. In Brazil, almost a third of its energy is from hydropower, but multiple droughts means the energy gap had to be filled through imports of liquefied natural gas. g. Five countries increased their carbon intensity over 2013: France, US, India, Germany, Brazil. Contributing factors included increased coal consumption to meet energy demand; a slower pace of change to renewable energy compared to other nations: and short term challenges in energy production. Under the UN climate negotiations process, all countries are expected to put forward their pledges, with the collective aim of reducing greenhouse gas emissions globally to limit the potential for global warming to 2°C by 2100. The E7 represents China, India, Brazil, Mexico, Russia, Indonesia and Turkey. According to the IPCC, levels of carbon dioxide (C02) are at their highest levels for forty years. The IPCC has warned that our current trajectory will lead to a warming estimated to range from 3.7C° – 4.8°C over the 21st century, with severe adverse impacts projected on people and ecosystems through water stress, food security threats, coastal inundation, extreme weather events, ecosystem shifts and species extinction on land and sea. At the higher levels of warming, many of these impacts are likely to be systemic, global and irreversible. About The Low Carbon Economy Index (LCEI): The LCEI model considers energy-related carbon emissions, driven by a series of assumptions including the economic growth projections, primary energy intensity and fuel mix share. The model covers energy and macroeconomic data from individual G20 economies, as well as world totals. Details of our model structure are available in our first LCEI report, accessible at the link here. Data on estimating the required pledges are based on taking the IPCC findings on potential emission pathways, as described in Chapter 6 of the Working Group 3 in the AR5 series, and comparing that with the emissions data/projection in the LCEI model. Further sense-checks are also conducted against the UNEP Emissions Gap report. An important caveat is that we have presented point estimates on required pledges and decarbonisation based on a series of assumptions, but in practice pledges and decarbonisation rates can fall within a range due to modelling uncertainties and climate variability.